You might not realize it, but for most of human history, price tags didn’t exist. In fact, they didn’t really take off until the 1870s when large department stores began opening. Before that, merchants typically sized up customers before they told them how much something would cost, and haggling over prices was part of the process. The only exception was stores run by Quakers. Yes, Quakers, the religious group that settled Pennsylvania. They had a “same price for all” policy and didn’t negotiate their prices. And interestingly, Rowland Hussy Macy, the guy who founded Macy’s department store, was a Quaker, so it stands to reason that he was one of the early pioneers of price tags. Of course, customers love price tags. Most people prefer not to have to negotiate, and it just feels fair when everyone is paying the same price for something. In fact, when Coke tried modifying its vending machines so that drinks cost more on hot days, consumers were outraged. NPR had a story about the incident and the whole history of the price tag that is pretty fascinating. But while people like price tags, set prices actually make markets less efficient. Capitalism works on the law of supply and demand, and when prices don’t change in response to demand, shortages or gluts in the market can result. However, if companies want to reap the full benefits of not having price tags, their pricing teams need to do a very good job with segmentation. The lone merchant running a general store in colonial America could probably do a pretty good job of setting prices just by looking at his customers’ footwear. Barefoot customers might pay one cent for a bag of flour. Those with plain, serviceable leather shoes might pay two. But high-heeled, red shoes with embroidery and fancy buckles might well bump your price up to 50. With today’s B2B buyers, salespeople don’t have the same kind of physical cues to help them discern which buyers might be willing to pay more. They need experienced pricing practitioners to analyze the historical data and group customers based on their willingness to pay. If you aren’t doing this kind of segmentation today — or if you think you aren’t doing it as well as you should — we have a few resources for you. 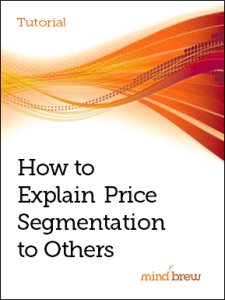 The webinar on The Fundamentals of Price Segmentation in B2B covers all the basics, and it’s a great place to start if you don’t currently have a segmentation model or you think yours needs some tweaking. If your executive team is resistant to the idea of price segmentation, check out the tutorial How to Explain Price Segmentation to Others. 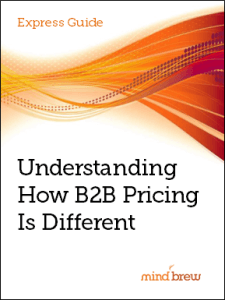 The express guide on Understanding How B2B Pricing Is Different can also be helpful, especially if you or some of your team members have come to B2B from the B2C world. If you grew up in the United States, you’ve probably absorbed the notion that everything has a price tag. But price tags aren’t the norm everywhere — or for most of history. And when it comes to B2B, not having a price tag is a good thing. It's dangerous to assume that the pricing principles are the same whether the buyer is an individual consumer or a business. This guide explains five important differences between B2B and B2C pricing and how you can use them to your advantage.